Proudly sponsored by the Charleston, SC Association for the Blind! "Can you take your dog everywhere you go?" "Why do you have that dog in here?" "Can I pet your dog? Why not?" "What's that dog doing in here?" If you are a handler, I'm sure you've heard these questions repeatedly. In fact, you're probably getting a little tired of answering them, right? You're probably wondering when folks are actually going to learn about the Americans with Disabilities Act, (ADA), and how it applies to service dogs. If you are sighted and have ever come across a guide team, you have most likely asked at least one or more of the above questions, if only out of curiosity. So many times, we guide dog users enter a business, restaurant, or public building and one of their less-informed employees approaches us negatively, questioning our legitimacy and, ultimately asking us to leave. Unfortunately, it seems the only times we hear anything in the news about guide-dog users is when their rights of access to a public facility have been denied by an uninformed individual and a lawsuit ensues. Dixie Land Guide Dog Users recognizes the need to be pro-active and has organized a new initiative called, "Paws To Educate" program that reaches out to various businesses, schools, hospitals and civic organizations in an attempt to offer sensitivity and awareness sessions to their staff. This interesting and informative program touches on the 3 R's: Rights, Responsibilities and Recourse" of the handler as well as the business owner. We have found that most folks who know about our rights to have our guides with us anywhere the public is invited don't know that we also have specific responsibilities to maintain to be able to usurp that right. They are also ignorant of the fact that, if we fail to maintain those responsibilities, that we can, in fact, be asked to leave their places of business without fear of discrimination. Of course, valid documentation (preferably from local law enforcement) is vital whenever we are fighting for our rights of access or when the business owner is striving to protect its clientele. So many times we have been shopping in a major department store when we hear a muffled bark of a small dog someone has sneaked in, claiming it to be a service dog or, we hear a scary growl from what seems to be a large animal just as it lunges at our dog. Store managers and employees approach us sheepishly, telling us about various individuals who bring their filthy, nasty, stinky dogs into these stores saying they are service dogs. These questionable characters allow their canines to urinate and defecate in the stores and laugh aloud as they walk off and leave the mess for a store employee to clean up. One man in the Charleston area has successfully passed off his 3 large Newfoundlands to be "seizure" dogs that work as a team! If they are, indeed, service animals, then he is certainly not fulfilling his obligation of keeping them under control. Dixie Land recognizes there are many problems regarding these matters and has organized its own "Paws To Educate" program in an effort to better educate both the blind handler and the sighted business owner so that everyone can understand and appreciate our rights, responsibilities and recourse. These sessions are available to any business, church, school or civic group within the state of South Carolina at absolutely no cost. Of course, donations will be accepted, though. We contour our programs to be as long or as short as necessary, always with allocated time for questions and answers. To schedule our "Paws To Educate" program for your group, simply Email the Dixie Land Guide Team. Dixie Land Guides Support National Braille Challenge! Brianna Murray, Charleston, SC spends time with her mom, dad and sister as she takes a break from the intensive competition of the 2010 National Braille Challenge in Los Angeles, CA. Blind since birth, Brianna is an honor student preparing to enter her senior year at the Charleston, SC School of the Arts, as a Violin Major. The Braille Challenge is Braille Institute's national reading and writing contest in Braille. It is a great way to motivate blind and visually impaired students to practice their literacy skills. Students test their skills in reading comprehension, Braille speed and accuracy, proofreading, spelling and reading tactile charts and graphs. More than 500 students from first through twelfth grades participated throughout the US and Canada on the regional level, in the Preliminary Round. The top-scoring 65 went to the national competition in Los Angeles, in June for the Final Round—two days of competition, camaraderie and fun! Brianna was among these 65 students, the First-Place winner in the 20-10 South Carolina Regional Braille Challenge, Varsity Division! Here she is, holding up the “Varsity” sign as she poses with her peers in Los Angeles. In 2008, Dixie Land Guide Dog Users voted unanimously to offer an annual scholarship in the amount of $100 for the first South Carolina student to contact us, with qualification for the current year's National Braille Challenge. 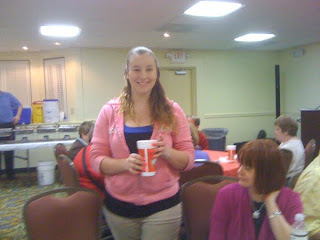 The Dixie Land Guide Team was truly honored to help sponsor Brianna’s trip to compete in California this year. We believe in the encouragement and support of a strong, positive presence within the blindness community and among the community-at-large. We promote Braille literacy, taking pride in the hard work and accomplishments of South Carolina's blind youth. Dixie Land Introduces "Paws To Educate"! Dixie Land's President, Nancy Moore, helps kick off our new "Paws To Educate" initiative! 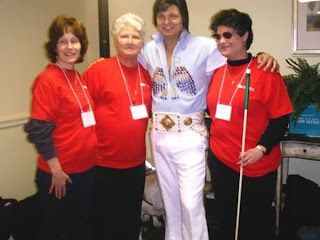 Nancy and her guide, Giza; Audrey Gunter and her guide, Zack and Laurel Jean, with her long, white cane, "Slim" team together to offer our very first program at St. Thomas Episcopal Church in North Charleston. There were kids of all ages present at the Vacation Bible School's special presentation and each learned something about blindness, guide dogs and long, white canes. Afterwards all harnesses were removed and everyone was given the opportunity to visit with our guides and us. 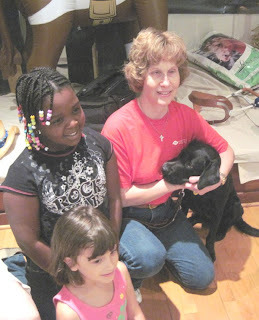 Our next program was requested by the Charleston Animal Humane Society, where we met and talked with about 20 teenagers. Although the theme was supposed to be about guide dogs, these kids were more interested in our blindness and how we cope with living without sight. We found this group to be especially intriguing and were appreciative to share various stressful situations with them. Although the motor vehicle laws in SC protect blind pedestrians, few of these young drivers even knew that a long, white cane and guide dog in harness were symbolic of the blindness community. 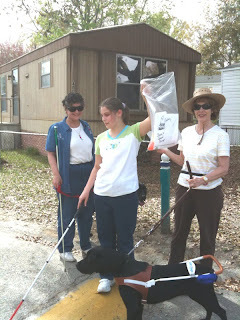 Dixie Land promotes education for the sighted and blindness communities in our effort to improve the community at large. If you are in the state of South Carolina and would like to learn how our “Paws To Educate” Initiative can help you, your church, community, school, business or civic organization, be sure to give us a call. We look forward to hearing from you! Some Highlights from Spring, 2010! Whether we are making our way through the masses or simply feeding and tending to livestock, Dixie Land Guide Dog Users seizes any opportunity available to show the sighted that we have lots of abilities, despite the fact that our eyes don't work! Here in this photo (used with permission of Island Photography), Christian music artist Laurel Jean (who also serves as Dixie Land's Secretary/Treasurer), proudly waves our banner as she embarks on the treacherous 10 K Bridge Walk on March 27, 2010. Laurel, an avid cane user, was approached by many folks that morning, commenting on guide dogs and family members who had had guide dogs. One lady even remarked that having seen Laurel preparing for the Walk inspired her with enough confidence to complete it. Laurel's official time in the event was 2hrs. 13 minutes and 6 seconds. Maybe not fast enough to win an award; but her presence on behalf of Dixie Land Guide Dog Users was priceless! Thanks, Laurel! Well done! 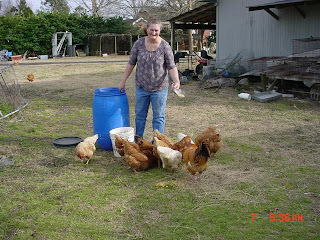 From the top of the Arthur Ravenel Bridge to the middle of the Hedrick's barnyard, guide dog user Sheryl Hedrick demonstrates that she has what it takes to competently manage her farm, despite the fact that she is legally blind. While her guide dog, Luke, enjoys some time off in another area of her farm, Sheryl tends to her goats, rabbits and chickens daily. The eggs she gathers provide her with a lucrative income, while offering delicious sustenance to her clientele. 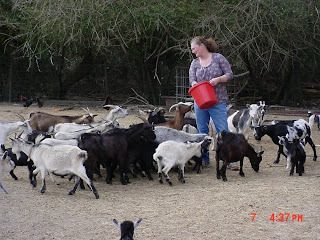 Sheryl also sells lots of those adorable Pigmy goats that folks seem to like so well. Sheryl promotes community education, too, and has been a real ambassador for Dixie Land Guide Dog Users. Whether teaching her Sunday school class; the Summerville Lions' Club or her local "Red Hat" ladies, Sheryl always projects a positive public image for our blindness community. She has even made several guest appearance on local television! Thanks, Sheryl, for all that you do! 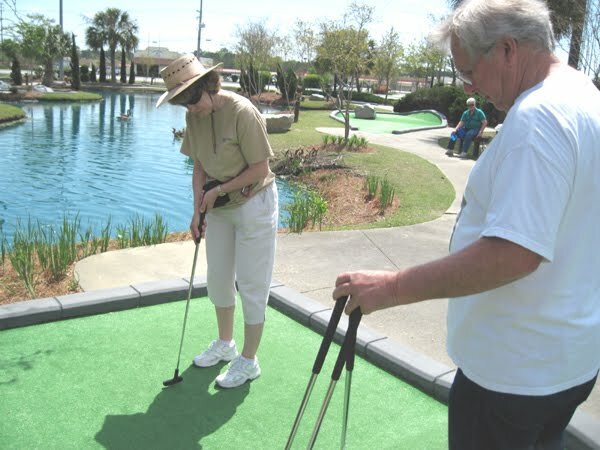 Dixie Land believes that we offer an educational experience to the sighted community each time we travel among them. Here, Laurel Jean tags along as Shelby Craig proudly participates in a special "Outta Sight" Easter egg hunt. This unique scavenger-style hunt was designed by Laurel Jean as part of her Chaplaincy for Blind Youth, and proudly co-sponsored by Dixie Land Guide Dog Users. The kids' problem-solving skills, O&M skills, and cane skills were challenged as they individually read the Brailled clues; made their way to the next stop and gathered each goody-filled egg. Upon completion, everyone proved to be a winner as each was presented with a McDonald's gift certificate! Dixie Land gets Teed off, or, at least tries to! Here our President, Nancy Moore leads us through the greens at Frankie's Fun Park as her new guide dog Giza looks on from a shady spot on the sidelines. Everyone laughed and had lots of fun as we taught ourselves and others that one doesn't have to be able to see to tee. It took us half the day to play half the course; but, at the end of the ninth hole, Taylor Jones was our winner! Taylor, another of the local kids in Laurel's Chaplaincy for Blind Youth, was accompanied by his great-grandparents, Betty & Jerry Stebbins, who have been extremely helpful in most of our community events. 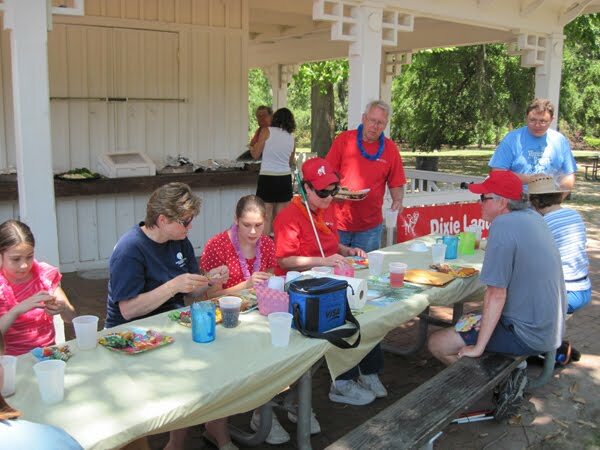 Shelby’s mom’s idea for a spring picnic inspired a special "Pawty in the Park", offering delicious food, fantastic fellowship and, of course, some of the best guide dogs (working & retired) in the whole, wide world. Northbridge Piggly Wiggly delivered the lip-smacking southern fried chicken, yummy 'tater wedges, baked beans and other fixin's, which, by the way, were all sponsored by Dr. Virgil Alfaro and his Charleston Neuroscience Institute. Although Hampton Park was closed to the general public, the kind folks at the City of Charleston Parks & Recreation Department issued us a special permit to exclusively host this event. We had lots of guests, including Cornelia Pelzer and Nicole Harvey, from the Association for the Blind; Carolyn & Jack Baker, from Grace UMC's Disabilities' Ministries; and Peter Smith and his friends from the Charleston Flyers. After eating all the great food and goodies everyone brought, we each had a turn on the back of one of the tandems. 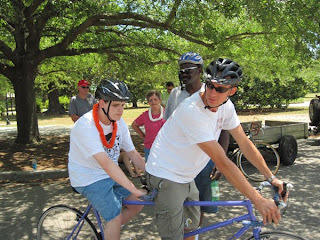 Even Shelby and Taylor (pictured here) co-piloted a bike around Hampton Park. The day seemed to end much too soon, but everyone had a great time. Dixie Land Guide Dog Users would like to "Paws" to thank Debbie & Bill Craig; Betty & Jerry Stebbins; Kim & Tim Taylor (with retired guide dog Rufus); Dorace Lackey & retired guide dog, Smokey; the Association for the Blind; Northbridge Piggly Wiggly; Charleston Recreation & Parks Department; Grace UMC; and, of course, the Charleston Flyers, for your part in making our "Poochie Park Pawty" so successful! We look forward to sharing more highlights with you real soon, and hope to see you at one of our future events! Poochie Pawty In The Park! to our Poochie Pawty in the Park! Dixie Land Guide Dog Users is holding our annual "Poochie Pawty" on Saturday, May 15, 2010 from 11 am until 3pm at Hampton Park. Come join the family fun, food and lots of furries! Try your hand at one of our accessible games (for our blind and sighted guests). Wrap your lips around some of our "gooder-n-snuff" fried chicken and wash it down with some ice cold good, old-fashion iced tea. You can bring a dish, if you'd like. We'll surely help you eat it, too! In addition to all the excitement and eats, Peter Allen Smith is planning to bring some of his Charleston Flyers to let us ride on one of those great tandems! So, Dixie Landers & Friends, all you have to do is just show up! Now, ain't that worth the effort? See you next month in the park! We just learned that Guide Dog Users of Florida, one of our Top Dog 2010 Sponsors, was featured in the Daytona Beach News Journal! Use the following link to read the article. Are you looking for an affordable groomer in the Summerville/Ridgeville, SC area? A friend of the Dixie Land Guide Team highly recommends “Scissors-n-Suds”, owned and operated by Amber McMahon out of her home, located off of Bacon’s Bridge Road in Summerville, SC 843-312-5028. Amber offers full grooming services, and understands the need for service animals to stay together with their handlers. She takes one appointment at a time, giving each dog her full, undivided attention. Each dog who comes in gets Shampoo, conditioner, nails trimmed and filed and ears cleaned. As of this posting, Amber charges around $18 or $20 for larger dogs, like Labs, and around $40 for larger dogs also needing a haircut or “shave down”. Anyone wishing to make an appointment during the week should call at least one day in advance. For Saturday appointments, please call at least one week ahead of time. This is not a paid advertisement. If you know of a service that you think would be helpful to handlers of guide dogs or other service animals, please let us know! 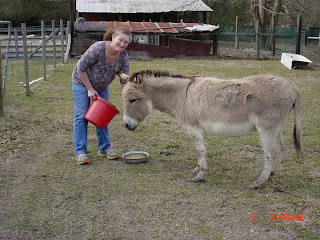 Pictured here is Dixie Land GDU President, Nancy Moore with her new guide, Giza. 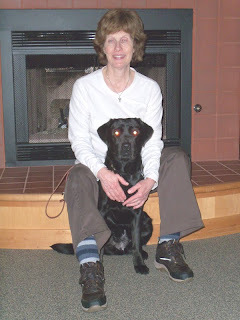 Nancy and Giza were just matched on the Oregon campus of Guide Dogs for the Blind, this past Monday, February 15. Both are doing well, looking forward to coming home and exploring Charleston. Newly-retired guide, Luna is learning to enjoy going for car rides, leisurely walks and just hanging out with her "Daddy", Dixie Land's "First Dude", Max. Our congratulations, and best wishes for the "First Family"! Top Dog Goes Whole Hog in Charleston! 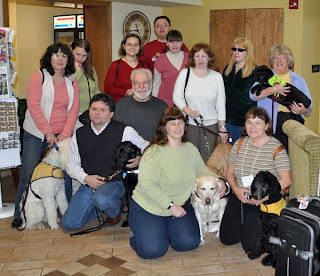 On January 15, over one hundred guide dog users, cane users, sighted puppy raisers and other friends of the blindness community from across the United States and Canada gathered at the Best Western on Spring Street in Downtown Charleston for Top Dog, 2010. Dixie Land Guide Dog Users take great pride in having hosted this event, in partnership with Guide Dog Users of Florida, North Carolina Paws, and the Charleston, SC Association for the Blind. From beginning to end, this weekend was filled with fun, food, fellowship and furries (working guide dogs, future guides with their puppy raisers and retired guides with their forever people). 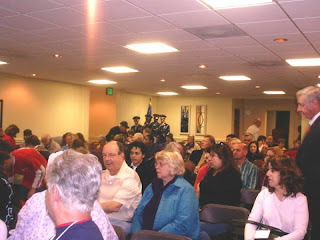 Thanks to a wonderful nightly rate provided by the Best Western, many people came in early, just to enjoy Charleston. We began registering folks on Thursday afternoon, January 14. All of our registered guests received a goodie bag, a program in either Braille, large print or electronic format and a commemorative Top Dog T-shirt and cap. Opening Ceremonies began on Friday the 15th. 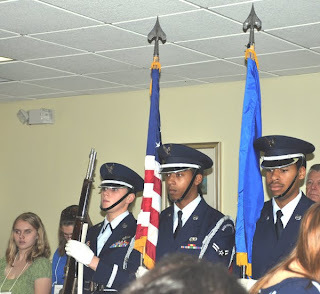 The festivities were ushered in by The Presentation of the Colors, with descriptive narration provided by John Johnston. Three of our Lowcountry Blind Youth, Shelby, Taylor and Brianna led us in the singing of our National Anthem, the Pledge of Allegiance and an Opening Invocation, respectively. A zany but extremely heartfelt Awards Ceremony followed, as Top Dog Funvention Chairman Audrey Gunter joined Program Chairman Laurel Jean Walden in presenting plaques to over twenty friends of the blindness community. Recipients included some of our nations top guide dog schools, along with other individuals, businesses and organizations. We wrapped up the evening with a reception, heavy snacks and lively music! Saturday morning began with a bagged hot breakfast. Our first session of the day, The Blessing of the Guides was officiated by Pastor Don ClenDaniel of Grace United Methodist Church here in Charleston. An alternate river walk was available to those who did not wish to participate in the Blessing. Three other sessions followed: “Maintaining Healthy Guides” by local veterinarian Dr. Ruth Roberts; “Yesterday, Today and Tomorrow”, an interactive panel discussion between blind youth and seasoned cane and guide dog users; and “Protecting Your Identity” by representatives of Prepaid Legal Services. After a bagged lunch, the day’s events were far from over! 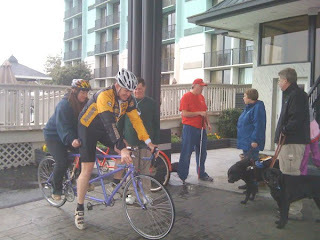 The line for our first descriptive narrated Charleston bus tour formed in the hotel lobby, while outside in the rain, the Charleston Fliers were busy with their tandem bikes. Seventy bus tour spaces were reserved in all, and thirty brave blind guests took a seat behind a sighted pilot on a tandem bike! For those who chose not to venture out, there was plenty to see and do inside! Our Exhibit Hall featured eighteen vender booths. Guests visited with several of the nation’s top guide dog schools, learned about services available to the blindness community, did a little shopping among blind artisans and musicians, and even took a “hands-on” look at some interesting critters! On Saturday evening, Top Dog truly went Whole Hog! Two dinner-theater style seatings featured a BBQ Buffet Roundup, complete with Live dinner music and special guest Michael Viljac (AKA Elvis)! 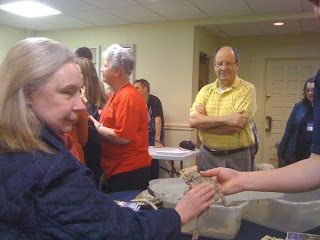 The evening was a tremendous success, thanks especially to our many sighted volunteers! On Sunday, folks began heading home. A bagged continental breakfast and an optional non-denominational Worship Service of praise and song rounded out this amazing weekend! Top Dog Charleston featured and honored at least 6 of the major guide dog schools; honored 24 various individuals and organizations for their continued support of the blindness community; provided outlets for 18 separate vendors, blind and sighted, at our Exhibit Hall; offered 70 folks their personal narrated tours of historic downtown Charleston on a nice, comfortable bus; afforded the opportunity for 4 pastors (2 of whom were blind) to bless at least 80 current and former guides; boosted the local economy by filling over 220 hotel rooms that would have normally remained empty, and eating at the many restaurants around the downtown area; allowed at least 30 of our blind guests the once-in-a-lifetime chance to ride on the back of a tandem bicycle through the streets of Charleston, (despite the rain); all the while employing and promoting a blind catering company, 2 blind musicians, 2 blind pastors, a blind masseuse, a blind woodworker, a blind jewelry maker and a blind public speaker. In addition to all of this, we included several of our local blind and sighted youth in all of our activities, recognizing the effect blindness has on a family. We transported at least 40 guests and their guides, current or future, from and to the airport at no charge, thereby reducing the already incredibly low costs for our attendees, allowing them a greater financial freedom to travel to our fair city. All of this and so much more would not have been possible without the devotion of our volunteers, the generosity of our sponsors, and the enthusiasm of our courageous guests! To everyone, and the dedicated workers of Dixie Land: Thank you! Thank you! Thank you!